Everyone assumes tropical islands are paradises, but are they really “para-dumps”? I grew up being told that that it’s bad to litter. Reduce, reuse, recycle. Avoid styrofoam and single-use plastic bottles that will never degrade. My klean kanteen has traveled the world with me. I try to avoid plastic packaging, and always bring reusable bags to the store. If I forget, I tend to stuff what I can into my purse or backpack and carry the rest rather than endure the guilt of taking a bag (I do live in Berkeley, afterall). Although I do my best to be aware of my impact on the environment and take steps to reduce my footprint, I know I am far from a shiny green example of environmental stewardship: plane travel has quite a heavy carbon footprint by itself, and there’s a laundry-list of other first world comforts I feel guilt over indulging in. I’m convinced we’re all hypocrites in one way or another, but where does that leave us? Another point of contrition within myself is a feeling that my research, even if inherently valuable and interesting, is not directly relevant to the major issues affecting the ocean. This is not a unique feeling among PhD. students. So, as I try to wrap up my research and write my dissertation, I often reflect about how I can contribute my academic skills and expertise to solving environmental issues. Working on the patterns and processes that shape biodiversity in fragile deep-sea environments has given me a unique perspective that I believe I can apply to many other systems. The picture is still hazy, yet I do know that I want to direct my skills as a trained scientist at understanding and finding solutions to issues affecting the marine environment, hopefully in the company of like-minded people. One issue that I’ve become increasingly more aware of and passionate about is the epidemic of marine debris. We have left our mark in plastic on the ocean from shipping containers with unknown contents, to lost or abandoned fishing equipment that continues to strangle marine animals for years (ghost fishing), to microplastics that form a soup we cannot see, yet builds up in the marine food web, and down to the deep-sea. A recent study in Science attempting to quantify plastic inputs estimates 8.8 million metric tons of plastic enters the ocean every year. Most of you have probably heard of the “Great Pacific Garbage Patch” which is actually more complicated than it sounds. National Geographic has some great pages explaining it. But in a nutshell, marine debris tends to be concentrated by gyres (large systems of rotating oceanic currents) where it forms a soup of small plastic particles and larger debris. There are five of these gyres; the most well known is the North Pacific, but there are also gyres in the north and south Atlantic, the Indian Ocean, and the South Pacific. The 5 Gyres group has documented the accumulation of marine debris in all 5 gyres including the South Pacific where the island of Moorea is located. 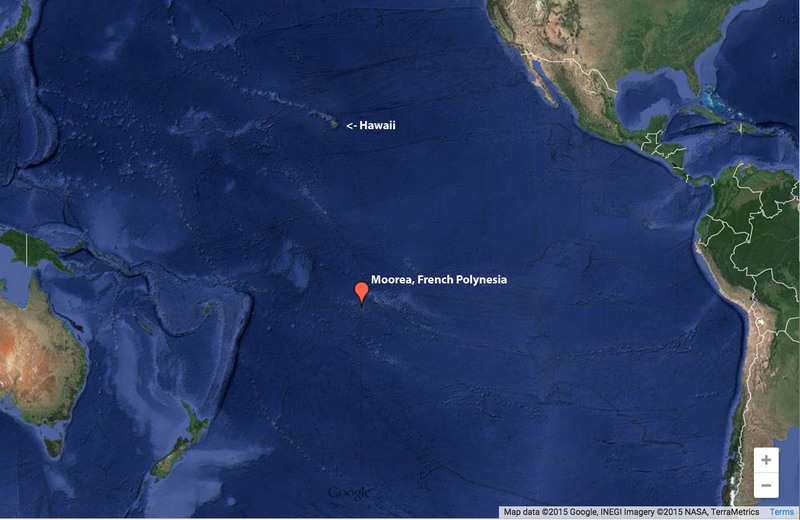 Map showing the location of Moorea, French Polynesia in the South Pacific, with Hawaii labeled for reference. Thus, before coming to the Gump Station Laboratory in Moorea, French Polynesia, I knew I might see evidence of the South Pacific gyre “garbage patch” phenomenon. To get a sense of the level of marine debris in my surroundings, I decided to do an impromptu clean-up of the Gump Station shoreline via kayak, limiting myself to one hour just to get a “snap-shot” of the trash that accumulates here. Although I filled a large mesh dive bag, I was actually somewhat surprised that the amount of trash wasn’t overwhelming. Most of it was wedged between rocks, or half buried by sediment, and had likely been lodged there for a long time. Some bottles and cans were so tightly packed between rocks, and plastic so buried, that I could not remove them unless I came back with tools. But I think the most upsetting plastic item I found was plastic sheeting that is used to prevent erosion on shoreline property. This stuff becomes brittle under the tropical sun, and breaks off bit-by-bit into the ocean. Sad. 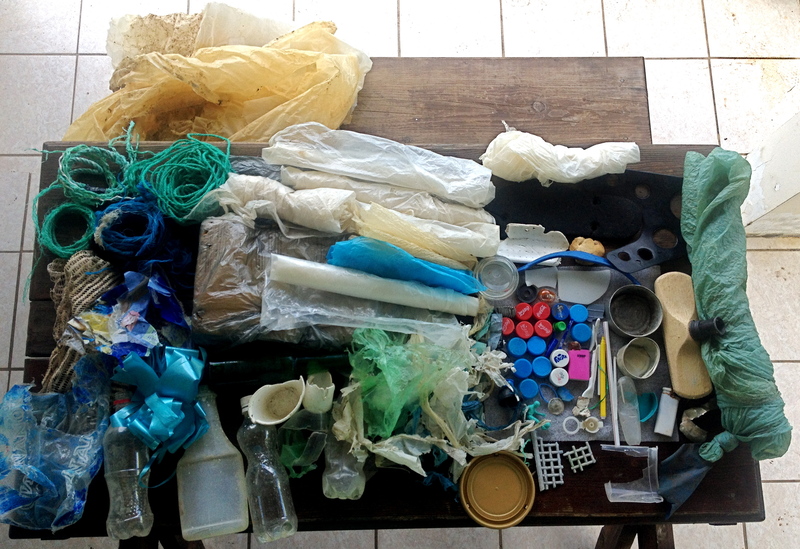 The trash I collected via kayak in one hour along the UC Berkeley Gump Station shoreline covers the picnic table outside my bungalow. The truly sad thing though is that after weeks of taking students to field sites at beaches, bays, streams, and forests in this “tropical paradise” we noticed that the debris is not an isolated phenomenon, and certainly not limited to the marine environment. In most places you could find plastic trash, especially small pieces when looking closely. At Temae beach (a site where students snorkeled almost every day for projects) trash bins were overflowing, resulting in uncontained trash and plastic bottles scattered just meters from the shoreline. If you went further into the swampy area near the beach you would enter what one of the students referred to as “hell.” A trash ridden, mosquito infested abandoned palm plantation that has become an unregulated dumping ground, whether intentionally or not. 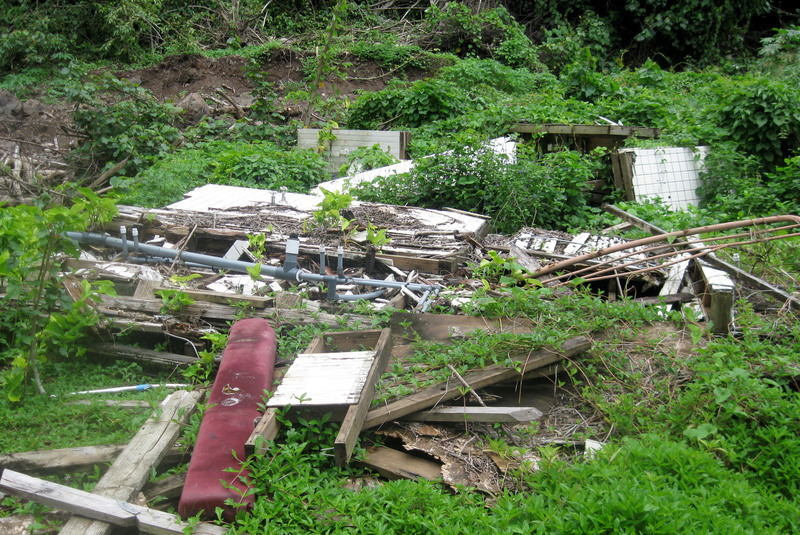 Unfortunately, this was a study site for one student studying the endemic Moorea Kingfisher and its ability to utilize abandoned palm plantations as habitat, and it was not the only one that had dumping ground symptoms. These native birds would probably have an easier time if the available habitat were not so contaminated by trash. Dumping ground in Moorea, French Polynesia. Photo credit: Anna Petrosky. On a rainy day, I went with another student to survey her stream sites and even though the water was brown with silt, I saw frequent plastic debris along with branches flowing downstream. 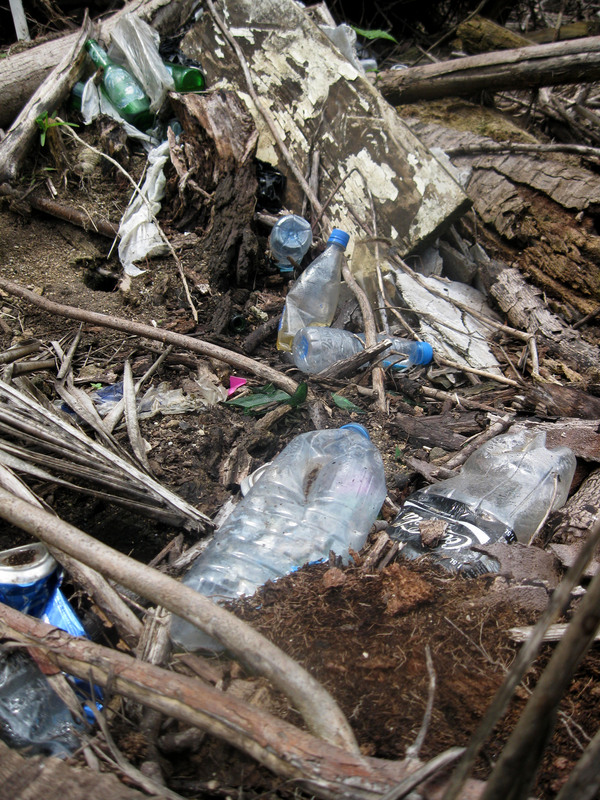 Trash containment is clearly an issue, illustrated by the many trash-ridden forest and beach sites and apparent flow of debris down streams to the lagoon and potentially out to sea. So, how is waste being managed? There are dumpsters and even recycling bins, and trash burning is a common practice, which may reduce the amount of trash to dispose of but certainly isn’t good for air quality. In times before westerners and the tourism industry brought the convenience of bottled beverages and plastic wrapped French cheese, most waste would have been organic. Now the proportion of plastic in trash heaps has increased due to these influences, making the emissions from burning them more toxic, and making waste in general a much larger problem to deal with for these small isolated islands. These are just my personal observations from only 10 weeks on Moorea, but it’s no secret that French Polynesia’s waste situation is a “nightmare” as reported in 2013. 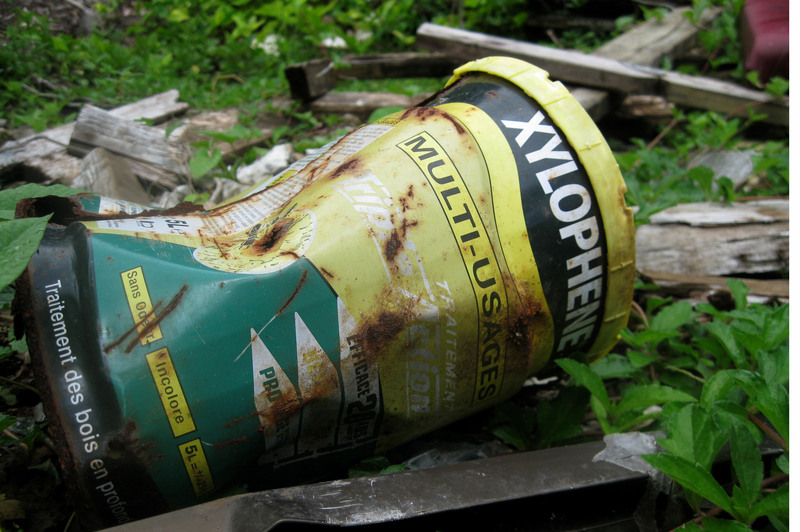 Unregulated disposal of hazardous waste on Moorea. Photo credit: Anna Petrosky. Dumps, like those near Temae beach, are unregulated and not constructed to prevent secondary pollution, resulting in contaminated water tables among other problems that affect wild and human populations. Excessive human waste and pollution are global problems, but Moorea is a poignant example of the link between excessive human consumption of unsustainable materials, poor waste management and a portal for that waste into the ocean. It’s startling to think that similar situations exist in countless island and coastal communities and also at much larger scales in many other places in the world. The recent Science article highlights the scale of the plastic problem and cites China, Indonesia, the Philippines, Vietnam and Sri Lanka as the top marine debris offenders. However, this is a global problem, and we should not take this data as permission to point fingers away from the US. After all, how much of China’s emissions, pollution, and waste are at the behest of American consumerism or even direct products of American companies? Clearly, a shift needs to happen throughout the system, from top to bottom. Reduce the production of indestructible polymers; promote production of more durable, repairable goods; minimize packaging; reuse, recycle, or at least contain society’s waste so it doesn’t trash our planet. Only then can we begin to clean up what’s already been trashed. It’s a tall order I know, and nothing new, but it’s time for a change and counting on collective individual action alone just isn’t going to cut it. Next Article My Phinishing Talk: a summary of the sciency things I’ve done to get a PhD.